If you picture a lace edging on a shawl the majority of the time one would probably imagine delicate lace dripping off of the edges. But it occurred to me that it might be fun to have the lace up around the neckline where it can flatter the wearer’s face. This shawl is my experiment to see what would happen. Another big consideration in the design of the shawl was to show off the unusual Alpaca/Cormo mix of this beautiful yarn I acquired at the 2018 Interweave YarnFest. It was the perfect color of green and had such an interesting feel in the hand I just had to purchase it. 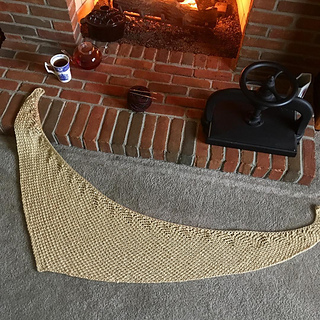 Looking at the Ravelry database for this yarn it appears that the skeins I had might have been a bit light on the yardage (I know that sometimes show specials are like that) so if you use the same yarn I did you will probably be able to make an even bigger shawl than I managed. The lace in this pattern is a simple mesh and the basic texture pattern allows the yarn to show off. Once blocked the Alpaca really shines and the shawl has amazing drape. If Sport weight yarn isn’t your thing this shawl can easily be worked in other weights. The open ended nature of the pattern will allow you to increase or decrease the number or repeats easily. You will need to adjust your needle size to get a drape that you like in your chosen yarn. The pattern instructions can be worked both entirely from written instructions and in chart/written combination. If you would like to see the shawl in action you can see a pattern tour on my YouTube Channel Watch Barbara Knit here.